I graduated from the Medical University of Warsaw, My postgraduate internship was at the Outpatient Clinic of the Military University of Technology. 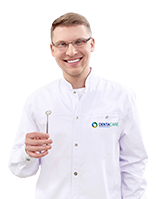 I regularly expand my knowledge at various training sessions and courses in conservative dentistry with endodontics, prosthodontics and dental surgery. Patients appreciate my kindness, aesthetics of work and individual approach to every single case. Outside of work, I like to spend my free time painting, sketching, baking cakes, designing and sewing on a sewing machine – I enjoy manual works, and the experience I gain is transferred directly into the workplace. Indirect composite reconstructions in posterior teeth – inlay, onlay, overlay and endocrown restorations. How to reconstruct a single missing tooth – making an adhesion bridge using the direct and indirect methods. Filling of root canals using various methods – success in endodontic treatment. Taking impressions for prosthodontic works on implants in theory and in practice.